In this guide we’ll take a look at the best digital pianos. What is the Best Digital Piano? If you’re a piano teacher or a professional pianist, you probably want to find a digital piano that is as much as the real deal as possible. The Yamaha YDP184R Arius might be exactly what you’re looking for in that case. It is the best digital piano under $3000 that I’ve come across. What strikes me the most is that the sound and the feel is so much like an acoustic piano. I’m seriously doubting that I would be able to tell the difference if I was to be blindfolded and asked if it was acoustic or digital. The whole experience of playing it is remarkably similar to playing a good grand piano. The keys feature synthetic ivory which is smooth to the touch and also absorbs ‘finger moisture’ as Yamaha themselves call it. 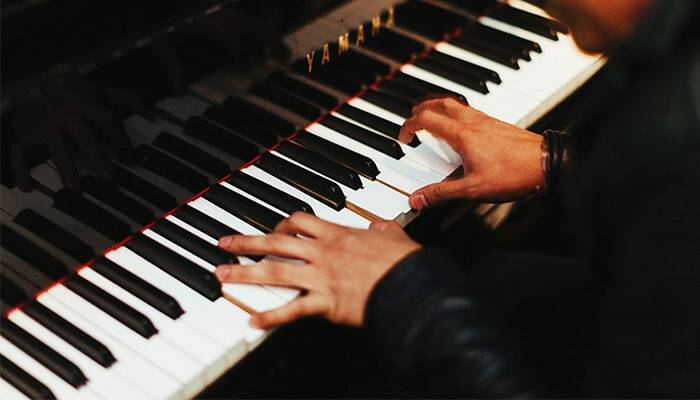 The fact that your fingers don’t stay super sweaty gives you a good grip of the keys so that you don’t slip, which is particularly good when you play fast passages. Another thing that makes this piano so good is the very authentic sounds. I especially enjoy how the low and high notes sound just like they do on an acoustic piano. The graded hammer action helps here too, the low keys and the high keys feel different from each other, as it should be. If you want to have all the benefits of practicing on a digital piano but want to be used to the feeling of an acoustic one, then you’re going to like this piano. This is a model that is pretty advanced, and therefore best for advanced pianists. This model also features a bunch of things that are particularly good if you’re teaching or being taught, such as a split keyboard, recording (play back what you learned at your lesson), and an app that makes it easy to change settings, sounds, and record. This piano is designed to recreate the greatness of Yamaha’s flagship concert grand piano, and even though I’ve never tried that piano, I must say it seems as if they have succeeded! When it comes to their digital pianos, this is the best Yamaha model at the moment. Did you read through the review about the Yamaha YDP184R Arius and thought to yourself ‘I wish I could afford it’? Here is a surprise for you! Yamaha has another model called the Yamaha YDP162 Arius, which is very similar to the more expensive version with a few differences! The biggest difference is probably the polyphony, this model only has a 128 note polyphony, but that’s still ok, especially if you’re a beginner or intermediate player, you’ll probably never notice any notes dropping. This piano is also sampled from Yamaha’s best concert grand piano, so the sound is still really good, even though it’s more affordable than the expensive alternative, out of all the options, this is the best digital piano under $1500. It’s definitely best for classical music, but works well for other genres as well. This model also features synthetic ivory keys which makes it easier to play, especially if you suffer from a little bit of hand sweat. Just like its big brother, this piano is perfect if you’re looking for a substitute for an acoustic piano. Perhaps you live in an apartment and want to be able to turn the sound down, or you move often and need to be able to move the piano without hiring a professional to do it. If you are just starting out playing the piano, it might feel hard to tell the difference between different models. There are five things I would recommend that you look for in your very first digital piano. You should be looking for a piano with 88 keys, preferably with hammer action. You also need a sustain pedal, MIDI, and as many different voices as you like. Is there a digital piano that has all of these things? Yes, and it’s called Flychord DP330! This piano is the best beginner digital piano on the market. As a piano tutor, I really love that you can split the keyboard into two identical sections. No more leaning over the student or playing low notes that just confuse them! This piano looks and feels almost like an acoustic piano, and is a really good option if you want the advantages of a digital piano but enjoy the feel of an acoustic. The keys feature synthetic ivory key tops, which are really nice to touch. People that suffer from hand sweat claim that this material is much better than just regular plastic, as the keys don’t get as slippery. But the best thing about this piano, that all young beginners love (and us adults too, let’s be honest) is the 500 different voices you can choose from. It’s really fun to try out the different sounds, I could do it all day! Many of them don’t sound very sophisticated, but normally beginners aren’t that picky. There are also 200 styles that you can jam along with, which is a really good way to practice improvisation. Some pianists want to get a digital piano that is as close to the real deal as possible and are almost ashamed by the idea of having a digital piano that’s not even trying to look or feel exactly like an acoustic piano. On the other hand, many others feel like there is nothing wrong with moving on and entering the 21st century with style, leaving the old-style pianos behind. If you want a piano that is really nice to play, looks great (I love white digital pianos!) and has a really good selection of nice voices, then you might like Roland FP-90. This is probably the best Roland digital piano available at the market at the moment. I really like how touch responsive it is, it really allows you to shape the music exactly like you want to. One cool thing that contributes to the nice, full tone of this piano is the wooden sides that resonate when you play. It has 88 keys, so it’s a full-sized piano, but it’s still pretty light and portable. It features 316 note polyphony, which is max, so that also makes the sound even better since you never hear any dropped notes. Out of all the instruments I’ve compared, this is the best under $2000. This piano is great for beginners since you can use it with the Roland app ‘Piano Partner 2’, which is an app that teaches you to play songs, develop your sense of rhythm and allows you to track your progress. Using the app you can also save your settings, and you can have multiple users for the same piano. The built-in equalizer makes it possible to really change the tone and personalize your music and adapt it to any genre. Of course, there are basic features like layering sounds and split keyboard as well. You can also pair the piano with your phone via Bluetooth if you want to use the speakers to let Spotify or YouTube do the playing for a while. If you’re looking for a perfect bargain, Casio PX-870 is an excellent choice. It’s available in white and black and it looks really good, with keys that look just like real ebony and ivory. It has 19 different voices and 256 note polyphony, which is almost as good as it gets. You can layer different voices or split the keyboard, making it possible to really personalize your music. It is a full-sized piano with 88 keys and features graded hammer action, which makes it feel like you’re playing an acoustic piano where the low and high keys feel different. One thing that I really like about this piano is the sliding key cover. Instead of lifting a lid when you want to play you just push the cover up and it goes into the body of the piano, meaning that it looks stylish no matter if the key cover is down or up. You can record music on the piano and share it via USB if you want to send it to your family and friends. This might not be the most advanced digital piano on the market, but it really feels like Casio has decided to focus on quality over quantity, and the features the piano does have are very good. If you’re looking for pianos and want to find the best digital piano under $1000, you’ve found it! Hard to find any cons! Who doesn’t dream of owning a grand piano? The answer is only the people who already have one. For many people, a grand piano will always remain just a dream. They simply don’t have room for it and frankly, it can be very expensive too! A baby grand piano is the second best thing, which can make your dreams come partly true. Artesia AG-50 is the best baby grand digital piano you are going to find! It looks amazing and the sound is great as well. It features 6 speakers that deliver concert hall-quality sound and really makes you wonder if this really is a digital piano at all. That is until you try out the other voices and the rhythms and realize that you’re probably better off buying this digital baby grand than a regular grand piano anyway. There are 136 different instrument sounds to choose from, all sampled from real musical instruments. The feel is really good thanks to the graded hammer action. It really feels like playing a good acoustic piano. One thing that I really like is that the piano has Bluetooth so that you can connect it to your phone or tablet. You can use this in a few different ways, for example by using different apps to learn to play. You can also play a song from your phone and jam along with it. Quite expensive, but you get what you pay for! As soon as people hear that I teach piano, they start telling me about how they quit their music lessons when they were kids. And every single person who does that says that they regret it and wished their parents hadn’t let them quit. But truth be told, if a child isn’t motivated, it’s not going to work. My job is to make sure that my students stay motivated and think it’s fun to play. In my opinion, playing iPad games that teach you the piano can be a really good complement to piano lessons or in some cases even replace them, depending on what the goal is. If you’re a parent looking for the best digital piano for your kids and will help your child stay motivated I recommend The ONE smart piano. The very first thing that you’ll notice is the lack of buttons. It has a very clean design without things that might distract children, especially those who have concentration difficulties. It might look like this piano can’t do very much, but it really can! As soon as you connect it to your phone or tablet, a whole world of possibilities opens up. It works for both iOS and Android. Using an app, you’ll have access to over 4000 songs that you can learn. Sheet music is expensive, so a library of that many songs is great! There are also over 100 video lessons that start by teaching you the basics, as well as tutorials and games that you and your child can play. When you learn a new piece, blue lights above the keys light up. The piano itself is good too, it has 88 weighted keys and three pedals. It supports MIDI and you can use it to record music. I feel like the creators of this piano really have thought about the needs of children who are just starting their piano journey. If you want to find the best budget digital piano, I’d go for the Yamaha P71. It’s an Amazon exclusive model that is basic but works well enough for beginners and music enthusiasts. If you, for example, play another instrument and only occasionally use a piano for tuning that instrument and perhaps letting a friend accompany you once in a while, then this is a good option. It does have 88 weighted keys, but since it lacks graded hammer action it doesn’t feel like playing an acoustic piano at all, it really feels like playing a pretty affordable digital piano, if you get what I mean. It has ten different voices, which isn’t much, but at least it’s something. On the plus side, it’s really light, so it’s perfect if you need to bring it with you to places or move it around the apartment. Imagine this scenario: You and a few friends start a band, and you will be playing the keyboard. Now, you just assume that everybody will get that you can’t bring your piano with you to someone else’s house, but then Kevin, who plays the drums, makes the point that there is no way he’s going to bring his drum set every week to practice. Kevin does have a point. A drum set isn’t that easy to bring with you, but a piano can be! At least if you have a piano called Yamaha YPG-235, which is the best portable digital piano out there! This digital piano only has 76 instead of 88 keys, which makes it smaller already. It’s also very light and therefore easy to bring with you to band practice or wherever you need to play the piano. 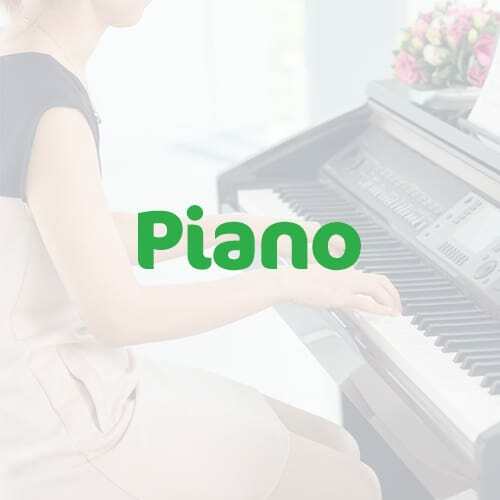 This might not be the right instrument for you if you want to have a piano sitting in the same place at home to practice and become a really skilled pianist. If you are playing at an advanced level, this might be the extra instrument that you bring with you, but you’ll have a better piano at home. Even Yamaha knows that it’s mostly beginners that are interested in this piano, and it has 30 songs built-in songs as well as 70 extra songs on a CD that’s included. There is also an interactive lesson system where you practice the hands separately. The keys aren’t weighted on this piano, and it’s not that nice to play, to be honest, but if you’re just going to play a few chords in Kevin’s garage, you’ll be fine. If you’re looking for the best digital piano for church, you should check out Yamaha P115. It’s a really good digital piano with 88 keys and graded hammer action, so it’s almost like playing an acoustic piano, except it can do so much more! The speakers deliver a very balanced sound, and the piano sound is sampled from one of Yamaha’s best grand pianos. It has 13 additional voices as well if you want something different than the piano sound. So what makes this piano special? The fact that you can control it with an app! This makes it easy to select your preferred settings, and you can even save them for later, which is very useful! I like that you can use different settings for different songs easily, not all songs have to sound the same! It’s also pretty light and easy to move around. 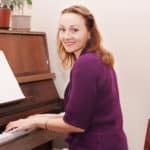 There are ten different piano styles that you can use to get a nice left-hand accompaniment by just pressing a single key with your left hand. This means that even if you haven’t been playing for too long, you can still play really nice tunes. The black keys have a matte finish, which not only looks nice but also makes them feel nicer. Sometimes you just don’t want to spend thousands of dollars on an instrument, for example, if you’re a beginner just starting out. Perhaps you don’t want to spend more than $500? Yamaha P45 is the best digital piano under $500 that you can possibly find! Yamaha P45 is a good alternative for beginners since it has 88 keys, which is a full-sized keyboard and graded hammer action, which means that it’s similar to playing an acoustic piano. You can split the keyboard in two so that your piano teacher can demonstrate stuff without you having to get up and swap seats. It has USB so that you can use it as a MIDI keyboard in case you want to try your hands at some music production. One thing that makes me think that you probably are going to want to upgrade from this piano as you get better is that it only has 64 note polyphony. This is sufficient in the beginning when you’re not playing very hard pieces, but when you get better you’ll start to notice that the notes drop, which can be really annoying and disturbing. Therefore I feel like it is a bargain in a way because you get a working piano for a cheap price, but at the same time, if you are serious about your piano playing it might be a better investment to buy a slightly more expensive piano with better polyphony. It’s so easy to buy something cheap only to realize later on that you really need to get a more expensive model that you could have just bought from the start! If you still feel that this piano suits your needs, then go for it. At this price range, this is as good as it gets! Before you go ahead and buy a digital piano, it’s probably best that you think your purchase through properly. Ask yourself ‘Why do I want a digital piano?’. It’s true that there are many advantages to a digital piano, but generally speaking, nothing beats a good acoustic piano when it comes to sound and feel. Not to mention how good they look in your living room! 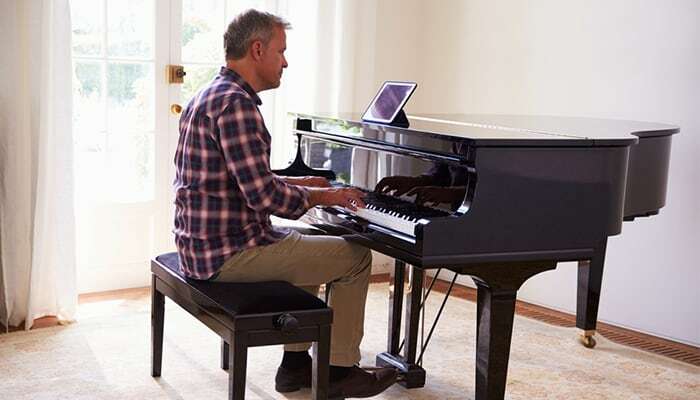 Before you make your purchase, read through these reasons to get a digital piano and see if any of them beats the advantages of an acoustic piano! 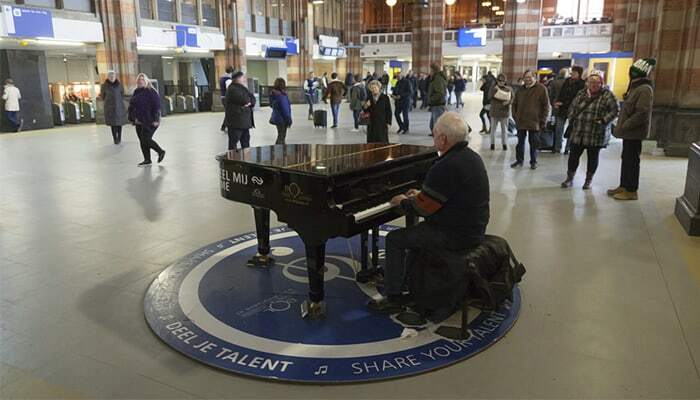 It’s no secret that digital pianos take up much less space than acoustic ones. If you are living in a small apartment, or still living at home and need to keep the piano in your bedroom, it can be really handy to be able to put the piano away, maybe under the bed or under a table. And speaking of tables, if you really don’t have room for a piano, you could put it up on a table instead of a stand when you want to play it and save room that way. The weight issue is another thing to keep in mind. It’s not easy to move acoustic pianos, and you need to hire professionals to do it, so that the piano, your back, and steps, walls, and floors stay intact. Moving a digital piano, on the other hand, is easy, and this is a good thing not only when you move house, but also if you want to bring the piano with you to gigs, weddings or wherever you want to play. Another big advantage to digital pianos, which especially apartment dwellers appreciate, is that you can turn the volume down and even wear headphones when you play. 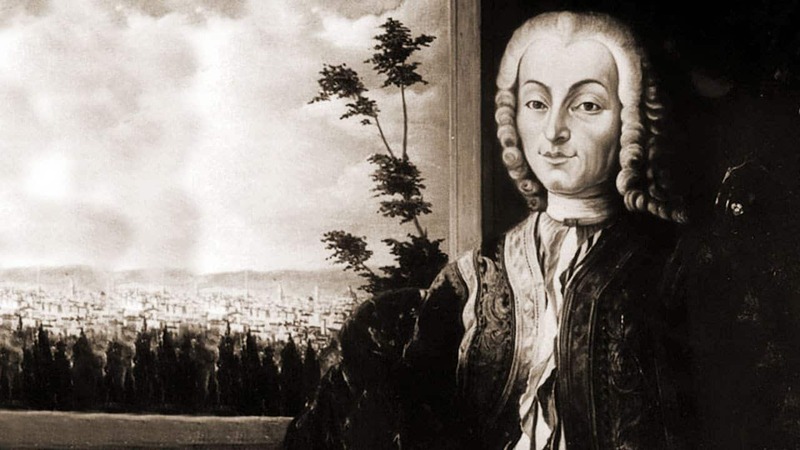 Many pianists are afraid of disturbing the neighbors, which is something that actually often limits them as to how often and for how long they can practice. So if you love to practice for an hour or so in the evening, you might want to get a digital piano so that you don’t have to worry about your neighbors. Another group of people that appreciate being able to change the volume is parents that want to practice when the kids have gone to sleep. One great thing about digital pianos is that they most often have many different voices, or sounds, to choose from. This makes playing more enjoyable as you can choose a voice that you think works well with the particular song you’re playing, and it’s also something that can make kids practice more. Of course, this can’t be done on an acoustic piano, so if you want fun voices and endless possibilities, a digital piano is the way to go. As somebody who has owned both acoustic and digital pianos, I find it so much easier to keep the digital piano clean, as I can dust it in the middle of the night without any neighbors hearing. It might just be me, but I think this is a pretty big advantage! Another great thing about digital pianos is that you don’t have to get them tuned once a year, which can get really expensive. You also don’t have to be super aware of where you position the instrument. With an acoustic piano, you need to put it far away from windows, front doors, and radiators, and make sure that the air has the right humidity, but digital pianos aren’t that sensitive at all. Obviously, the fact that digital pianos are, well, digital, opens up a lot of possibilities in itself. You can connect it via MIDI to a computer to produce music and you can jam with yourself using different accompaniment modes. We’re going to get into all of the cool features that digital pianos offer further on in the article, so for now, we can just establish that producing music is much easier with a digital piano rather than an acoustic. There are so many different features that modern digital pianos offer, and it can feel like a jungle to figure out what they all are, what’s necessary, and what’s not. We’re now going to take a look at the most common features that you’ll encounter when you research different models. Let’s start with the obvious, the keys. They are your most important tool when you play the piano, and therefore it’s good to be aware of what to expect of them. You’d think that most digital pianos feel the same to play, but what the keys are made of, how many they are, and other aspects will make the playing experience very different from piano to piano. A full-sized keyboard has 88 keys, and as a piano tutor, I would recommend that you get one with 88 keys. There are some digital pianos available that have fewer keys, and they are often a little bit cheaper than the full-sized models, so it might be tempting for a beginner to buy one of those and save a little money. The problem with this is that if you keep your piano playing up, as you become better and better you will miss those extra keys, and you might end up buying a full-sized piano after all. So if you cheap out, you might actually lose money in the long run. Isn’t it much better to just buy the right instrument to start with? One exception to this rule of thumb might be if you know that you are just going to bring the piano to gigs and you need a compact little thing that is easily portable. But in this case, you need to really know that you won’t be playing anything that requires more keys. Also, if you feel like you fit in on this description, you might instead want to look for a keyboard, rather than a digital piano. 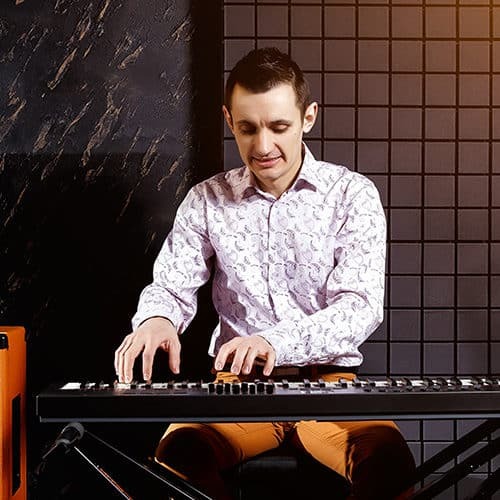 Keyboards generally have fewer keys and more voices and other cool features and they are specially made for modern genres like pop and rock, that might not require as big a register as classical music and jazz often do. What the keys are made of can really affect your performance. If they’re too plastic-y and slippery, you might struggle to play fast passages, especially if you suffer from hand sweat. Even though no digital pianos have ivory keys, the more expensive models will have a surface that resembles the touch of ivory and makes the keys less slippery and nicer to play. The best way to find out if you like the surface of the keys is to simply go to a music shop and try the piano out before you place an order. The way the keys react to your touch can be really different. Some entry-level pianos have keys that aren’t weighted, and the keys offer no resistance whatsoever. This also means that you can’t do much to change the tone in terms of volume, even if you slam the key down, it will sound pretty much the same as when you’re playing a lullaby. The next step is semi-weighted keys. You’ll find this in pianos that are slightly more expensive, and they give you a little bit more to work with. Next, we have weighted keys, and they are heavier to press down, which allows you to alter the volume since they are touch sensitive. The very best kind of keys is called hammer action keys. In an acoustic piano, little hammers strike strings when you press down a key, and hammer action keyboards imitate the feeling of this process. This brings us to the last type of keys, which is by far the best if you’re going to be playing classical music and jazz. It’s called graded hammer action. If you’ve ever played an acoustic piano you know that pressing down the bass keys and the trebles don’t really feel the same. You don’t have to press the high notes as hard as the low notes. What graded hammer action does is that it resembles this feeling. This is particularly useful if you will, for example, play a digital piano at home, but an acoustic piano at your lessons or at school. It feels really weird to practice on a digital piano without graded hammer action and then play an acoustic piano! Most digital pianos will come with a sustain pedal, but the quality of these pedals is not always the best. Not that it doesn’t do what it’s supposed to do, it’s just that some of them are small and seem impossible to press down without it running away from your foot. You can solve this problem by simply taping it to the floor, or you can buy a sturdier pedal. Some digital pianos will also have a soft pedal, which makes the sound softer, and in very rare cases a sostenuto pedal in the middle. If you’re a beginner to intermediate player, it’s enough to just have a sustain pedal. One thing that digital pianos have that acoustic don’t need is speakers. All digital pianos will have built-in speakers. Make sure that you don’t buy a MIDI-keyboard, which is only to be used plugged into a computer and therefore doesn’t have any speakers. Don’t worry if you read that the digital piano you want to buy supports MIDI, just make sure that that’s not its only function. Generally speaking, the speakers get better the more expensive the piano is, so if you buy a cheap piano you might want to consider buying extra speakers that will do your music justice. When it comes to headphones, you’ll find that most digital pianos are compatible, but for some, you might need an adapter if you want to use your normal headphones. Many digital pianos offer a range of sounds or voices. Instruments like different kinds of pianos, organs, strings and wind instruments are very common, but percussion, electric instruments, and human voice samples are also available. The quality of these voices definitely vary, and for the cheap models, they are more something to play around with for fun rather than use in a real performance. Interestingly enough, some of the more expensive digital pianos don’t offer hundreds of different sounds, and my theory is that they assume that their customers are more interested in having a good substitute for an acoustic piano. Sometimes it’s possible to sample your own sounds. You can record your dog or another instrument, and when you press down the keys they will play that sound in different pitches. Many digital pianos offer the opportunity of splitting the keyboard in two, so that you can, for instance, play piano with your left hand and strings with the right. Another way that some pianos can be split is when they have a teacher mode. Then the lower half of the keyboard is transposed up so that the lower half of the piano sounds exactly like the upper half. This can be very useful for lessons as well as four-hand playing. You can often layer sounds as well, so you can get a piano and an organ sound at the same time. There are lots of other effects available, like pre-recorded styles to jam along with, accompaniment features that follow the chords you play and turn them into something cool, arpeggios and so on. Many pianos will also feature different rhythm patterns and a metronome. Some will have built-in games that teach you how to find certain notes an intervals, and they may even be able to teach you how to play a few songs. Keys that light up when you play is also something that is quite common in digital pianos for beginners. The idea is to teach you a song by lighting up the keys you’re supposed to play. I wouldn’t recommend buying a model just to get this feature, as I don’t believe it’s a particularly good way to learn, and chances are you will only be using it a few times before you get sick and tired of it. Some digital pianos have a built-in recording tool, which allows you to record music and listen to it. This can be useful if you want to hear what your playing sounds like, as well as if you want to compose music. If this is a feature you want your digital piano to have, see how many tracks you can add, the more the better! Then you can use USB to get it to your computer. Another way to use your digital piano to record music is to use MIDI. MIDI is not really recording the sound, but rather the signals. This means that if you connect your piano via MIDI to a computer, it registers the signals and can play it back to you. You can then choose what kind of instrument you want it to sound like, and play around with it a lot more than if you just recorded sound using a microphone. Another great thing about MIDI is that using a music notation program, you can convert MIDI files to sheet music. Some modern digital pianos come with an app that you can have on your phone or tablet, which makes it easy to change settings and save them for later. This is not really a feature that is absolutely necessary, but it can be useful and fun, and I guess it would impress your friends as well. All the digital pianos you will encounter on the market support polyphony, which means that they can play several notes at the same time. The more notes a piano can hold at the same time, the better. The different numbers of notes are 16, 32, 64, 128, 256 or 316. 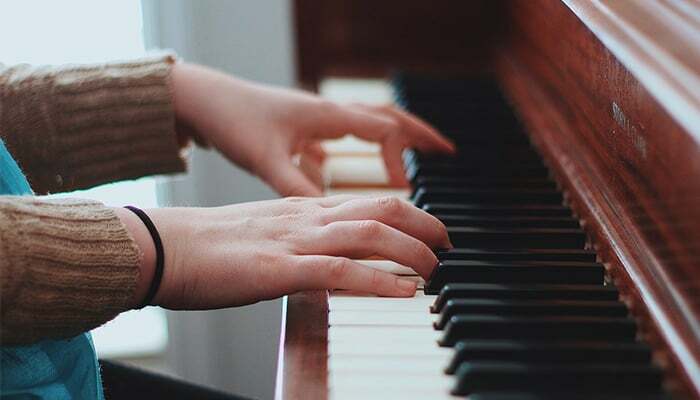 It might seem weird to have polyphony that is more than 88 notes since there are only 88 keys on a standard size piano, but there are more aspects that use up the polyphony than just pressing down a key, for example, the sustain pedal. Without getting too technical, we can conclude that it’s really useful to have as high polyphony as possible. If you, for example, only have 16 note polyphony, as soon as you have played 16 notes, even if you hold the sustain pedal down, the first note you played will drop out when you play note 17. But as I said, you will probably notice this happening long before note 17, because the polyphony doesn’t only get used up just by pressing down keys. How much polyphony you need depends on what kind of music you will be playing, but if you can afford to get a digital piano with 128 or 256 note polyphony, then go for it, it’s never going to be a disadvantage. Having good polyphony will make your music sound fuller and richer, whereas it might sound really boring if you only have 16 note polyphony. If you’re about to buy your very first digital piano as a beginner, I’m going to make it easy for you. Here are all the things you should be looking for in your first digital piano. If you get a piano with these things, chances are you’ll be able to use it for many years without having to upgrade any time soon. Still, I do get that some beginners are willing to compromise on some of these things in order to save a few bucks. After all, the piano might eventually end up in the basement together with other equipment for hobbies you used to be into. But if you know that you’re going to keep your piano playing up it’s worth to invest a little to get these things. Sometimes, you can buy a bundle with everything you need to go with your piano, which can be a good deal. A piano and a sustain pedal are the two things that you just can’t live without, but there are some other things that can make your musician life easier. A stand to put your piano on is usually a good idea, and a bag can be really useful to transport it. Headphones and a stool with adjustable height are also good to have. Most pianos will have a music rest for your sheet music. Instruments are investments, and the old saying “you get what you pay for” is very much true in this case. To get a new, playable digital piano you will need to spend about $400 or more. If you want to spend less, wait until there is a sale on or you can find a good model second hand. If you buy a used piano, make sure to test it before you commit, and try so that all keys are working, as well as the pedal, the display, and the buttons. There are so many models to choose from, how can you know which digital piano to go for? The most important thing is to consider what your needs are, which is determined by what you’re going to play. If you just want to buy a piano so that you can let your kids try to play ‘Twinkle, twinkle, little star’ by ear, then you might want to buy a pretty basic model. On the other hand, if you have a dream of becoming a concert pianist, you will want to find a model that is as much like an acoustic piano as possible. Why not write down your needs and expectations on a piece of paper before you start looking into specific models? That way it will be easier for you to tell if a piano suits you or not. One great way of comparing different pianos is to look up video reviews on YouTube. This is usually a better way to find out more about them than simply reading reviews since you get to really see, and most importantly hear the pianos in question. As you research the different pianos, keep a list of the ones you’re interested in, along with pros and cons for the different ones. If you don’t write them down or save them somehow, you will forget what models you have already looked at, since many are very similar. Going to a music shop to try out the different pianos is the classic way of doing it, and lets you really get a feeling for if you like an instrument or not. So that’s it. Everything you need to know before you buy a digital piano. I really hope that what you’ve read in this article is going to help you to find the perfect piano for you!